Mirs. Morley and Miss. Readie teach P1/2A. 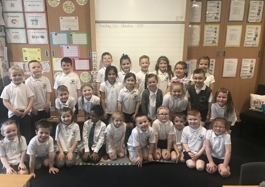 Primary 1 have been learning all about Park View since starting school. They will also learn about ‘People Who Help Us’ in term 1 by exploring jobs in the local community. Primary 2 have been studying books written by Julia Donaldson. The children have particularly enjoyed the stories ‘Stick Man’ and ‘Room on the Broom’. Our PE days are Mondays and Thursdays. The children are developing their ball skills and building confidence in dance. To help your child at home please work on their literacy and numeracy targets listed on their target sheet. Miss. Stobo and Miss. Beattie teach Primary 1/2B. P1 pupils will be learning all about ‘Our School’ and ‘People Who Help Us’ whilst they settle into Park View. P2 pupils will be looking at a short novel study by Julia Donaldson and will read some of her books and complete a range of literacy and art activities linked to these. Our PE days are Tuesday and Thursday. Please check the target sheet and sign and date when your child has achieved this target, they will show their teacher their skills and receive a special certificate at Achievement Assembly and a star on their target sheet which will be shared with the class! 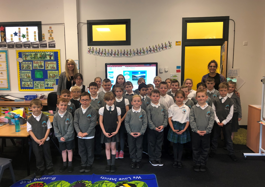 Primary 3 have got off to a flying start and have settled well into their new classroom and routines. 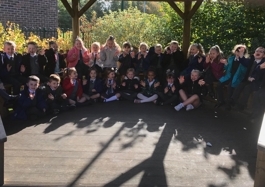 The children enjoyed carrying out some of our getting to know you activities and begun making lots of new friends. Our class will have PE on Wednesdays and Fridays (outdoor weather permitting). Please check that every item of clothing is clearly labelled with your child’s name and class. This term we are doing a novel study for our topic. ‘The Enormous Crocodile’. This topic will combine other curricular areas such as Literacy, Technologies and Expressive Arts. You can extend your child’s learning at home by researching interesting facts about Africa and crocodiles. You might also want to visit the library to select some booked to encourage your child to talk about what they have been learning. Miss. Watson and Miss. Sheikh teach P3/4. This term, for Interdisciplinary Learning, we have been learning about ‘Under The Sea’. We will be learning about different locations of seas/oceans around the world, researching different creatures/plants and presenting this information to our classmates. We will also be learning about ‘overfishing’ and ‘pollution’. Our class will have PE on Wednesday and Fridays. Please ensure that your child does not wear jewellery to school on these days. We have been enjoying looking at the additional Numeracy and Literacy tasks in the ‘Little Bit Extra’ jotters and will be continuing to monitor these targets in class and in homework. Our interdisciplinary topic this term is World War 1. We have been using literacy lessons to examine the roles of soldiers on the front line and women on the home front. Our topic will culminate with a visit to the trenches at 'Digging In' where the children will take part in hands-on activities that explore life for Allied and German soldiers 100 years ago. In Maths this term Mr Law is focusing on addition, subtraction and multiplication. Miss Henderson is leading lessons on 2D and 3D shape. Homework is issued weekly via our Class Blog. https://blogs.glowscotland.org.uk/glowblogs/mrlaw/ Homework jotters will be collected in, marked and returned to pupils every Thursday. Our Class Blog has weekly links to educational websites, interesting articles and fun events. Children should check the blog every few days. Our current topic is World War 1 to coincide with the centenary of the end of the war. We will be looking at artefacts, stories, photographs and personal accounts to learn about the war and the impact it has had on our world. We will also be organising a collection for Poppy Scotland to show how grateful we are to all those who have served. In Maths our focus will be on addition, subtraction and times tables and we will also be looking again at 2D and 3D shapes. In Literacy we will be working hard to improve our writing to include more WOW words and a more interesting range of punctuation, and in reading we will be learning to use our predicting and summarising skills. Our PE days are Monday and Friday. We will be improving our skills in basketball and dance. In Literacy and English we have been reading our new novel, ‘Carrie’s War’ and have been working on various active reading strategies including visualising and making self, text and world connections. Miss Henderson takes the class on a Wednesday for Listening and Talking and Grammar. Our Big Writing lessons are linked to our Social Studies topic, World War 2. So far we have created persuasive propaganda posters, job adverts for a soldier and made notes about the Blitz in Scotland to write our own mini books. Mr Mckissock has also been working on answering questions using unseen texts to enhance our comprehension skills. Mrs Phillips has taught us about place value and rounding large numbers to millions and beyond, in Numeracy and Mathematics. We are currently working on decimal place value and rounding. Mr McKissock has taught us about co-ordinates and symmetry and we made some eye-catching pictures for our maths display! The class will enjoy a trip to the Tall Ship in Glasgow after the October break to learn about role of men and woman during World War 2 and the shipbuilding industry on the Clydeside. We can’t wait!